The earnings crunch is back on this week. Third-quarter reports are due from tech, financial and pharmaceutical companies, from airlines and from many others. Here's a day-by-day rundown of the coming week's earnings highlights, with a closer look at Apple (AAPL), Harley-Davidson (HOG), Netflix (NFLX) and Southwest Airlines (LUV). Getting things started on Monday, when analysts surveyed by Thomson Reuters expect Citigroup (C), Halliburton (HAL) and IBM (IBM) to post year-over-year earnings growth. But Monday's highlight no doubt will be Apple's (AAPL) quarterly results. Apple continued to roll out the iPhone 4 and launched Ping during its fiscal fourth quarter. Analysts forecast earnings for that period come to $4.06 per share, which is up 31.8% from the same period of last year. The iPad and iPod maker's revenue for the three months that ended in September is expected to come to $18.9 billion, or a whopping 91.1% more than a year earlier. For the full year, the forecast calls for earnings of $14.56 per share (+37.6%) and $63.8 billion in revenue (+74.5%). Apple's per-share earnings have topped analysts' expectations in the past five quarters, by as much as $1.58 per share. Apple's long-term EPS growth forecast of 19.2% is better than that of Dell (DELL) or Hewlett-Packard (HPQ). The forward price-earnings (PE) ratio is 17.9, but that's less than the industry average and Apple's trailing PE ratio of 25.2. The return on equity (ROE) is 25.5%, the PEG ratio is 0.93 and the net cash flow from operations has grown in the past few quarters. The First Call recommendation has been to buy AAPL for more than 90 days, of course, and the mean price target is currently $347.51 per share. Bloggingstocks contributor Sheldon Liber would like to see Apple announce this week that it will reward shareholders. 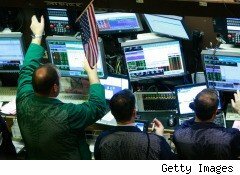 Shares reached an all-time high of $315.00 on Friday. The crunch really get under way on Tuesday, with earnings growth expected from the likes of Altera (ALTR), Bank of America (BAC), Coca-Cola (KO), EMC (EMC), Intuitive Surgical (ISRG), Occidental Petroleum (OXY), Parker Hannifin (PH), Peabody Energy (BTU) and Yahoo! (YHOO). For a third quarter in which Harley-Davidson sold a subsidiary and reached new agreements with the unions, the Milwaukee-based motorcycle maker is expected to post EPS of 36 cents per share. That's up from a year-ago profit of 11 cents per share. But revenue for the three months that ended in September is expected to be essentially flat year-over-year, or $1.1 billion. Looking ahead to the full year, analysts foresee earnings of $1.16 per share (+74.1%) on revenue of $4.1 billion (-3.7%). The per-share earnings results have topped analysts' expectations in the past two quarters. The long-term EPS growth forecast is 10% and the forward PE ratio is 21.5, but that's much less than the trailing PE ratio and the industry average. The dividend yield is 1.24%. The consensus recommendation is to buy HOG, and the mean price target is $33.45. But Standpoint Research downgraded the stock, seeing it as overvalued due to takeover rumors. At $32.30, shares are 37.2% higher than three months ago, rising well above the 100-day moving average in the past month. Goldman Sachs (GS) is also scheduled to post results Tuesday, but like Johnson & Johnson (JNJ), Lockheed-Martin (LMT), New York Times (NYT), State Street (STT) and Supervalu (SVU), it is expected to report an annual earnings decline. Expectations are high for Netflix's quarterly report on Wednesday. Analysts anticipate the leading movie rental subscription service will report that third-quarter EPS grew 27.8% year over year to 72 cents per share. During the three months that ended in September, Netflix launched its service in Canada as well as for iPhones and iPods, and revenue for that period is predicted to have risen 30.2% to $550.9 million. Analysts also expect sequential and year-over-year growth of revenue in the fourth quarter. Earnings results have been better than expected in recent quarters, by as much as a dime per share. The long-term EPS growth forecast for Netlfix is 26.5%, which tops that of Coinstar (CSTR), operator of the Redbox movie rental service. Netflix's forward PE ratio is 47.9, but that's less than the industry average and its trailing PE ratio. The company keeps enough cash on hand to cover long-term debt, and the ROE is 42.3%. Investorplace sees NFLX as a buy ahead of earnings. The stock has pulled back from a recent all-time high of $174.40 and ended the week at $155.72. Wednesday's other anticipated reported earnings gainers include Abbot Labs (ABT), Altria (MO), Boeing (BA), Delta Air (DAL), Eaton (ETN), Genzyme (GENZ), St. Jude Medical (STJ), Stanley Black & Decker (SWK), United Technologies (UTX), US Airways (LCC) and U.S. Bancorp (USB). On the other hand, eBay (EBAY) and Wells Fargo (WFC) are expected to post EPS about the same as a year ago. Also look for the Federal Reserve's next Beige Book report on Wednesday. Thursday's highlights include American Express (AXP), Capital One (COF), Caterpillar (CAT), PNC Financial (PNC), SanDisk (SNDK), Union Pacific (UNP), United Parcel Service (UPS) and Xerox (XRX), which are all expected to post strong earnings growth. During the three months that ended in September, Southwest Airlines announced its acquisition of AirTran and declared its 136th consecutive quarterly dividend. The Dallas-based no-frills carrier is expected to report that EPS for that period came to 25 cents, compared to a mere 3 cents per share a year earlier. Third-quarter revenue is expected to have jumped 18.8% to $3.2 billion. So far, analysts predict full-year EPS of 17 cents (+73.2%) on revenue of $11.9 billion (+15.2%). Note that earnings results have met or beat consensus estimates in the past five quarters. Southwest's long-term EPS growth forecast of 18.7% is better that that of competitor JetBlue (JBLU), and its forward PE ratio is 17.1, which is less than the industry average. Analysts on average recommend buying LUV, and their mean price target on shares is $15.63. DailyFinance contributor Gene Marcial likes Southwest's potential. Shares have met resistance at $13 since the beginning of the month, after rising from around $11 at the end of August. Others predicted to post EPS growth on Thursday include Amazon.com (AMZN), AT&T (T), Hershey (HSY), JetBlue (JBLU), Philip Morris (PM) and Reynolds American (RAI). The day's expected earnings decliners include Diamond Offshore (DO), Eli Lilly (LLY), Nokia (NOK), Northern Trust (NTRS) and Travelers (TRV). The Philly Fed Survey and the Conference Board's Leading Economic Indicators Index are due out Thursday, as well. And finally, Friday is anticipated to bring positive results from Schlumberger (SLB), Snap-On (SNA) and T. Rowe Price (TROW), but annual earnings declines from Honeywell (HON) and Verizon (VZ).